Because every wetland is unique, there’s no single right way to care for your wetland. Follow these four steps to get to know your wetland and learn what it needs. Before you can decide what care your wetland needs, you have to get to know your wetland. The best way to do that is to spend time in it during every season. It’s important to record what you see, either in a journal or with photos, so that you can compare your wetland’s conditions from season to season and year to year. As you spend time in your wetland and learn about it, you will learn what type of wetland you have, which will help you care for it. Where is my wetland within my watershed? How did my wetland functioned historically? How has my wetland changed over time, and have these changes harmed my wetland? What are my wetland’s water conditions? What kind of soils do I have? What plants live in my wetland? We know these are challenging questions that will take time and effort to answer, and likely some outside help from natural resource professionals. Our Resources page will connect you with tools to help you find the answers you need. Answering these questions before you undertake big actions in your wetland will save you time and effort and will make your wetland healthier in the long run. As you answer these questions and gather information about your wetland’s health, one great way to put it all together visually is by making a map. Update your map when you discover new information. Include lakes, streams, rivers, springs, and other water. Show drainage patterns by using arrows to indicate direction of flow. Identify adjacent land use and landscape features that may affect water movement into, out of, and through your wetland (roads, culverts, ditches). Note areas with standing water. 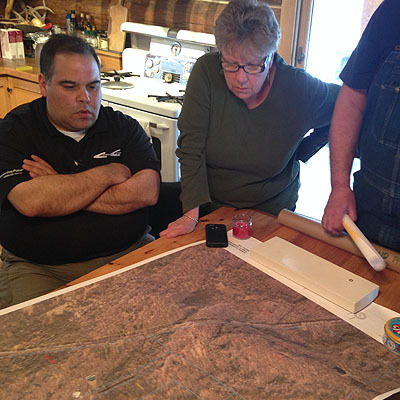 Map the actions you take (invasive species control, wildlife blinds, photo points). Once you’ve gotten to know your wetland and its condition, you can start planning how you are going to care for it. Create one or several goals for your wetland, guided by what you have learned about your wetland’s type, history, and current condition. Your goals may involve maintaining aspects of your wetland that are already working, or restoring or managing aspects that need improvement. Set several shorter-term objectives that together will help you reach your goal. Then make a list of the tasks that you need to do to accomplish each objective. Write down your goals and the tasks that will help you accomplish them. Not only does a written plan record your thinking, it’s also a good way to share your goals with contractors, neighbors, and family. Include a summary of your wetland’s historic and current conditions. Add a timeline where you can, noting seasonal or annual tasks as well as specific projects. Identify questions you still need to answer or information you need to learn. Update your plan as you learn more and see how your wetland responds to your actions. Guided by your goals, you’re now ready to take action. Healthy wetland hydrology (timing, frequency, and quantity of water) should be your first concern. If improvement is needed, actions to improve hydrology should be the first you consider. If your wetland’s hydrology is in good shape, your next concern should be controlling invasive species, improving water quality, and other actions you can take to improve plant and wildlife diversity. Sometimes the actions that would have the greatest positive impact on your wetland may be beyond your reach because of cost, permitting, engineering, or logistics. That’s okay. Keep your chin up, and work on other important steps that you can manage right now. Remember that the most productive and effective way to attract wildlife to your property is to maintain and promote healthy, natural habitats. Our resources for wetland landowners webpage has information about publications, organization, and more that can help you take care of your wetland. You can also read our tips and information for wetland landowners in our on-going updates for wetland landowers. Over the last century, fifty percent of Wisconsin’s wetlands were changed to different land uses such as crop fields, roads, and cities. Today, some landowners are bringing wetlands back. Bringing back former wetlands returns the benefits they provide to communities, agriculture, fish and wildlife, and to our communities. 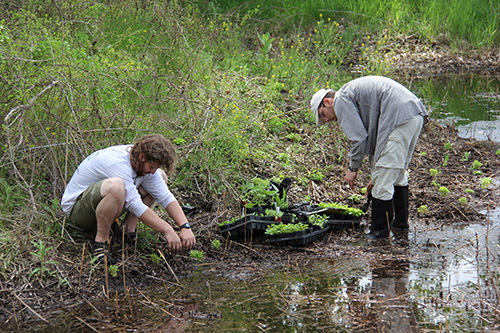 Bringing back a former wetland is called wetland restoration. Wetland restoration reverses historic changes in land use, especially changes to hydrology and plant life. Healthy water flow and plant communities in turn provide habitat for wildlife. Why would you want to bring back a former wetland? In many cases, the building blocks of wetlands (wetland soil, water volume, a seed bank) are already present. Reclaiming the land’s former capacity as a wetland can offer benefits to nearby agricultural lands, wildlife, and, your pocketbook. Learn more about the benefits of wetlands. 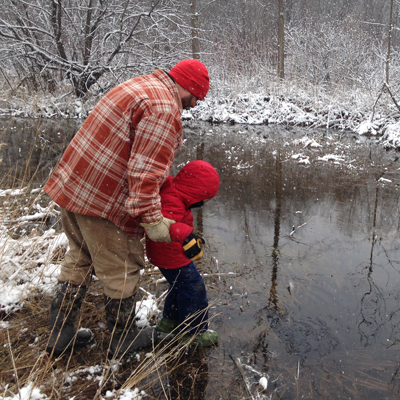 How can you recognize a former wetland on your land? Landscape clues: Do you have areas on the landscape that are lower and wetter than the surrounding land? Are the soils black? Are wetland plants growing in or around the site? Do you have frogs calling from the area each spring? Personal experience: Whether it’s yours, your family members’, the previous landowners’, or the neighbors’, personal experiences of the property provide historical perspective and knowledge. Are there years the site is too wet for a tractor? Can you see drain tiles emptying into streams or ditches? Have you witnessed a sinkhole from a failed drainage tile? Natural resource professionals: Professionals who have information about your site can help you learn about your land and its potential for wetland restoration. The good news is that, while bringing back a former wetland may require technical assistance, it involves the same approaches as caring for your wetland: understanding how the wetland functioned before, what’s changed, and how you can bring back historic conditions in a modern context. Find funding and technical support, suggested educational resources, and more in our resources section.